MSA solutions Archives - Settlement Professionals Inc.
Medicare eligible. It seems that when a defendant hears these words, CMS automatically places a target on your client’s back and aims for the bullseye. We have seen this happen year in and year out. That is why we crafted the ability to provide attorneys with holistic Medicare Set-Aside solutions. The label of being “medicare eligible” can lead to many un-truths. For example, defendants may claim that your client must create an MSA. Un-true. And this one: that defendants won’t be able to settle your case until they have proof that Centers for Medicare and Medicaid Services (CMS) has approved your client’s MSA. Un-true. Or, that you must obtain a CMS letter stating that an MSA is not required in your client’s case. Un-true, and not even possible. If any of this sounds familiar, it’s because defendants have been telling you un-truths about Medicare Set-Aside (MSA) arrangements for years. The truth is that there is no legal requirement for MSAs at all in liability personal injury cases. CMS is not approving liability MSAs. Also, CMS will not provide a letter stating that an MSA is not required in a specific case. In fact, MSAs are entirely voluntary. A conclusion that arose again as a result of the Aranki vs. Burwell case. Yet, this outcome doesn’t mean that MSAs should be ignored. No. Far from it. That is why we have tirelessly sought to provide Medicare Set-Aside solutions that address these untruths to help your client make an informed decision. Part of making an informed decision is knowing the history of MSAs, and understanding why MSAs should not be ignored. The Aranki vs. Burwell case evolved from a medical malpractice case that started in 2009 in Arizona. While a settlement had been reached, the defendants were still concerned about its finality due to the uncertainty of the MSA question. A lot was unknown about MSAs back then, and the defendants thought they would be liable without a court decision on its necessity. They demanded that the plaintiffs supply them with a letter from CMS stating whether or not the client was required to set up an MSA. With no immediate answer, the settlement was held up for three years. That is until a federal judge issued a pronouncement. The judge stated that no federal law or CMS regulation requires the creation of an MSA in a personal injury settlement. It gets better. This judge was also asked to rule on forcing CMS to issue a letter as to whether or not this client needs an MSA. The ultimate finding being that there’s no federal law that requires it [CMS to issue a letter], so the court doesn’t see any standing here to even comment. No MSA required meant case closed, and this decision has acted as the ruling going forward. Yet, recent events indicate that a change could be coming soon. After this memo, a clamor for guidance followed. With that, came an advance notice of proposed rulemaking. Issued on June 15, 2012. This advance notice, addressing liability cases, includes seven different options. All of them for handling the Liability Medicare Set-Aside issue. Especially alarming is option number four, below. It requires submitting a proposed MSA to CMS for review and approval. Fast forward two years later to October 8, 2014. CMS withdrew The Project for Public Guidance. This advance notice was part of that project. Yet, expectations that CMS will resubmit at some point in the future still loom large. Added to these is another concern. Earlier, CMS published an update to a pre-solicitation for a workers compensation review contractor. It states that a Statement of Work (SOW) update will include the processing of Non-Group Health Plan (NGHP) Medicare Set-Aside arrangements. The anticipated award date? November 7, 2016. All of these are signs that the U.S. Government has pivoted. 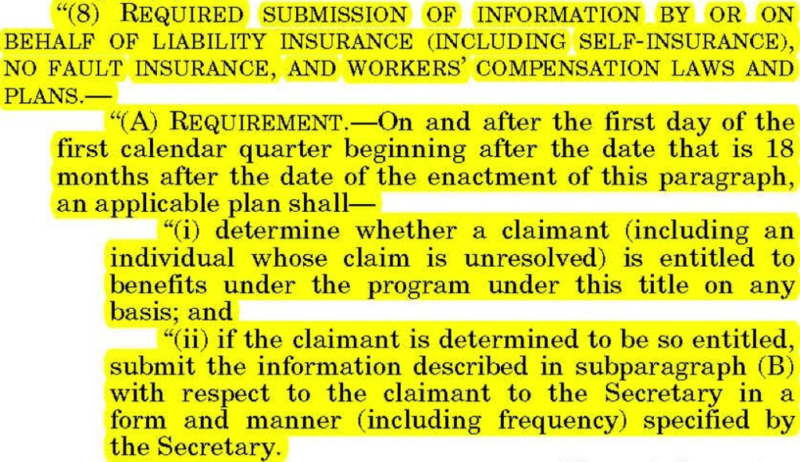 Also, that they are looking once again at Medicare Set-Aside arrangements in liability personal injury cases. Meanwhile, it’s important to decide whether, and which, Medicare Set-Aside solution is right for your client. That depends on their unique facts and circumstances. Also, whether they are a do-it-yourself or a do-it-for-you type. The law requires that we protect Medicare Trust Funds from payment for future services. That is true whether it is a Worker’s Compensation or Liability case. There is no distinction in the law. But how exactly will your client comply with the law? The old pick a number out of the air? Or a professional MSA Allocation Study? Then, next question, self-administer, or professionally administered? If they go the do-it-yourself route, can you trust that they will follow through and put some amount of money from their settlement in some sort of account? And then what, just decide on their own which Medicare bills should be paid? If and/or when Medicare comes around and questions how your client determined the amount of their account, demanding a detailed accounting of how they spent that money, how will your client answer? What if Medicare dislikes their answers, and decides to deny future benefits for a time? Will your client still be happy with the advice you gave them today? Whatever you do, don’t make these decisions alone. Take advantage of consultation services from The PLAINTIFF’S MSA AND LIEN SOLUTION. Sign up to receive our 2 Ways to Avoid an MSA guide. Together, we can decide if one of these can work for you. And if your client can’t avoid an MSA and wants professional help? Then we’ll create a custom, strategically-minimized Medicare Set-Aside allocation. One brought down to the lowest possible, reasonable and defensible number. The end result? More settlement funds in your client’s pocket. Less potential for future liability for you. The PLAINTIFF’S MSA AND LIEN SOLUTION is here for you. Please visit our website at www.plaintiffsmsa.com or call us with any questions at 888-672-7583. There’s nothing worse than a late hit. Most likely, you never even see it coming. As experts at The PLAINTIFF’S MSA AND LIEN SOLUTION, we see these too often. You roll with the punches, win your case, and win a settlement for your client. Case closed, right? Wrong. Because that’s when the blow comes. Medicare starts denying payment of settlement-related bills because they know about your client’s settlement. In fact, they know everything, your client’s settlement amount, attorney’s fees, litigation costs and liens, and the ICD-9 or ICD-10 disease codes that are part of the case. The feeling that this is going to come back to bite you is unshakeable, but just you wait. The language used in this mandatory Medicare liability settlement reporting requirement is disturbingly vague, leaving a lot of questions. What exactly are the defendants reporting about you and your client? How much information are they turning over, and when? The answers are alarming. (1) The date of settlement. (2) The total amount of the settlement, otherwise known as the Total Payment Obligation To Claimant or TPOC. (3) The ICD-9 or 10 codes that describe the injuries or conditions settled as part of your client’s case. That’s it. Yet, if these three points aren’t alarming enough, just imagine what is in the rest of the data points – all 193 of them. What does all of this mean for your client? Once this information is in to Medicare, they file it away for future use. Basically, the expectation is that Medicare is now, from the date of settlement forward, secondary payer to the settlement your client has just received for all of the future Medicare-allowable, accident or incident-related expenses covering the conditions or injuries that were the subject of the settlement. Those ICD-9 and ICD-10 disease codes? Medicare matches those up with future medical bills. A match means payment is denied, and your client is left footing the bill until they can prove they have spent their TPOC on Medicare-allowable bills, after which Medicare covers everything for the rest of client’s life. Yet, if your client’s settlement money has already been spent, or otherwise allocated, it gets worse. In the end, your client may be left with insufficient funds to both take care of denied payments and all of their other needs. And who are they likely to take it out on? Most likely it’s you. An angry phone call, a bar complaint, a malpractice claim? One or all of these could be your fate. Don’t let this happen to you. Put proper planning in place from the very beginning, and take control of your client’s Medicare issues with The PLAINTIFF’S MSA AND LIEN SOLUTION. What you don’t know about Medicare reporting and skillful use of strategically-minimized (and still voluntary) MSAs to avoid major client Medicare issues can affect your time, money and reputation. Let us help you through it, The PLAINTIFF’S MSA AND LIEN SOLUTION is here for you. Please visit our website at www.plaintiffsmsa.com or call us with any questions at 888-672-7583.